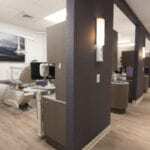 You would be hard-pressed to find another dental office like ours! Finding a dental office that you can feel comfortable at while getting the best in dental care is easier than you think. Here at Dental Oasis of Clayton, we set out in 2011 to bring the Clayton, North Carolina community something that exceeded expectations. We started by making the office itself a beautiful environment with a relaxed, anxiety-free atmosphere. Some call it a spa-like feeling to come to our dental office. We understand that because we offer Pandora music streaming, Netflix, Hulu, and other TV/movie streaming services, pillows, blankets, and neck wraps. All that wouldn’t mean much if you didn’t also get optimal dental care services at our dental office. Our team is dedicated to providing you with nothing but the best care possible, and our top-of-the-line equipment gives us the ability to give you cutting-edge services. For example, we have CEREC technology that allows us to take digital impressions (no more gross impression material!) and a mill in our dental office to fabricate crowns the same day. This saves you time and the annoyance of wearing a temporary crown and coming in for a second visit. When you also consider our extended office hours with early morning and early evening appointments to fit around your schedule, you can see that our dental office is dedicated to making it as painless as possible to get the dental care you and your family need. Call us today with any questions you may have or to schedule an appointment for an initial consultation, preventative dental services, or to resolve a dental problem.